Thane has been among the top cities of India, experiencing a fast development in real estate in recent years. 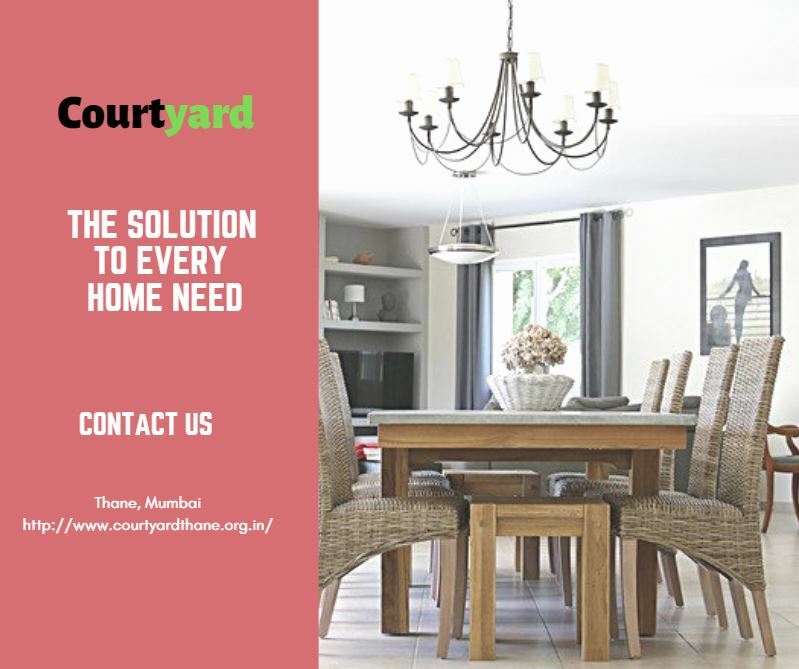 Homeowners looking for a quality residence in Thane can have a look at Courtyard. This residential complex has been developed by one of the top realty companies, and the apartments will be open for possession from December, 2018. Enjoy sophisticated 2 and 3 BHK apartments in the complex, with a wide range of amenities to deliver a sound housing experience. The location advantage of the estate is one of the prime advantages for the homeowners. If you are interested in acquiring one of these apartments, you may book them now. The Courtyard price ranges between INR 1.37 crore and INR 3.7 crore. People seeking the right mix of luxury and comfort can get an apartment in this complex and live up to their housing dreams. The apartments are spacious and come integrated with elegant interior designs. The large balconies and windows ensure optimum ventilation in the rooms, allowing the natural light and air to flow into the interiors. People with a fascination for green living facilities will enjoy a good time in these apartments. You can stroll in the walkways in the gardens, enjoy your time among the greenery and give a soothing sensation to your mind during the leisure hours. The floor plan of the estate has been carefully chalked out, ensuring the availability of a large common space for the residents. Thane is located in close proximity to Mumbai, which increases the commercial potential of the city. The transportation system in Thane is well-developed. A large number of roadways connect the area to the nearby destinations. Commuters can easily get across to the business hubs through these roadways. Commercially, Thane has witnessed a lot of development in recent years, with major IT companies and MNCs coming up in the city. The employment potential in the city is high, and a lot of corporate employees are seeking quality residences in the city. The prices of property in Thane are on the rise. With increased demand, residents from various parts of the country are looking forward to buy a home in Thane. For investors and homeowners, this is the right time to make their investment in these apartments. The prices are likely to further escalate in the coming months. Real estate in Thane has great potential for revenue. 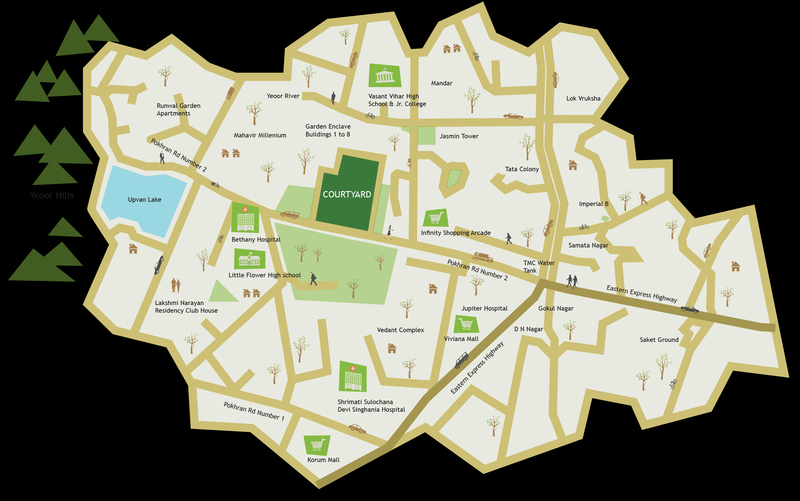 The residential complex is located close to the important schools, hospitals and other institutions. The residents can get a fast access to these areas. Besides, the places of entertainment are located nearby, with a large number of restaurants, bars, shopping malls, multiplexes and theatres coming up in close proximity to the estate. The residents can also enjoy the wide range of amenities in the estate, ranging from lifestyle to healthcare. Children can enjoy their leisure hours in the dedicated play areas. You can enjoy your time in the elegant clubhouse in the residential complex. If you are willing to invest in Courtyard Thane, this is the right time to make your move. Located at Thane, Pokhran Road, Mumbai. Airport in 35 mins of drive. BKC is just 35 mins drive. Fort is 40 minutes via Freeway. 10 minutes to Thane station. Vashi and Mindspace IT park is just 30 to 40 mins from Wadhwa project.